COVER SKETCH RICARDO FLORES MAGON September 16, 1873-November 21, 1922 A true mentor of La Causa, Flores Magon founded the newspaper opposition Regeneracion in 1900. He headed the Liberal Party in Mexico, was persecuted for his belief in justice and his hatred of corrupt government. 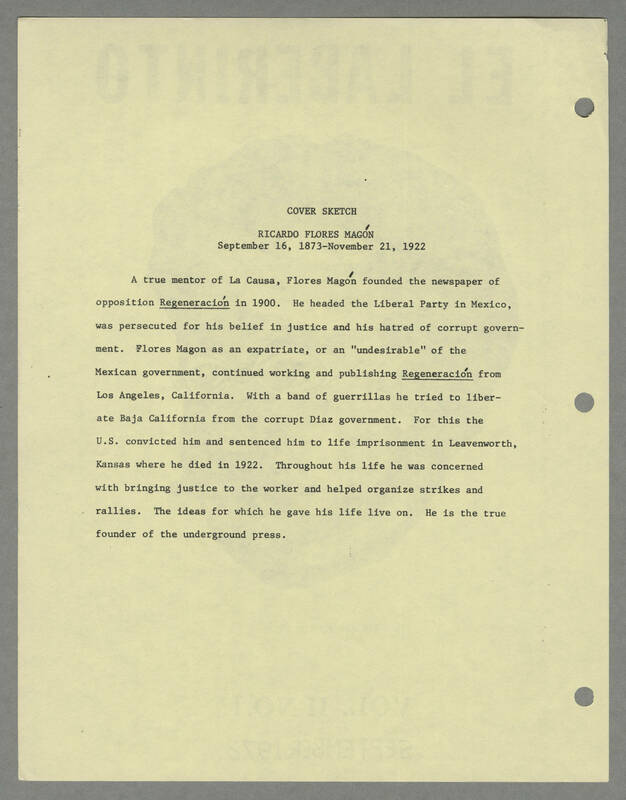 Flores Magon as an expatriate, or an "undesirable" of the Mexican government, continued working and publishing Regeneracion from Los Angeles, California. With a band of guerrillas he tried to liberate Baja California from the corrupt Diaz government. For this the U.S. convicted him and sentenced him to life imprisonment in Levenworth, Kansas where he died in 1922. Throughout his life he was concerned with bringing justice to the worker and helped organize strikes and rallies. The idea for which he gave his life on. He is the true founder of the underground press.